When trying to describe our family situation to people, it becomes a jumble of words or a very funny looking diagram written out on a napkin. Louisa May Alcott's Little Women is a classic for the ages. The March sisters had their differences in personality, but their home was still filled with general merriment until a moment of inexplicable loss. My modern family is not as simply framed. My sisters and I came from a plethora of mothers and fathers, each of us connected by a string of one-parent connections. My sister Jaden and I share a mother. Jaden shares a father with Nikki. Nikki, Jessica and Clarissa share a mother, but with different fathers. We are mixed nuts in the same can. 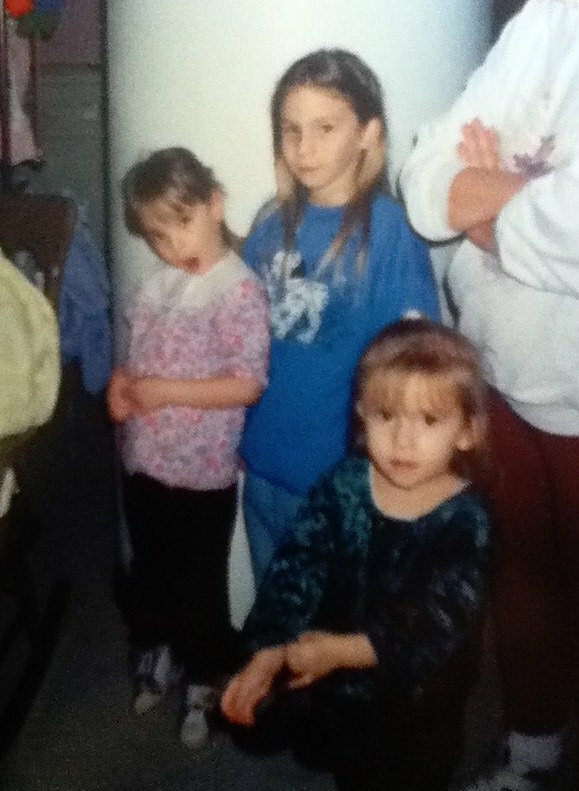 Faith, Jessica and Nikki as children. When trying to describe our family situation to people, it becomes a jumble of words or a very funny looking diagram written out on a napkin. We grew up together, but in too many different homes to count. Our parents did not get along during the midst of our upbringing, but they still encouraged us to support each other as siblings. Most days there would be two or three of us under one roof and we only all came together on the ever-popular "dad's house" weekend. Jaden and Nikki's father would have the entire group of us girls under one roof. My mother would also take in the girls that were not technically hers, as her own daughters. When I was home with Jaden, I was the eldest sibling. When playing pretend school I was the harsh, yet crafty teacher. But when Nikki moved in, she took up post and the teacher became the student. Our hierarchy roles constantly interchanged. Nikki was the eldest, but somehow I still wound up writing her high school history homework when I was eleven. We all became big and little sisters according to who needed guidance and support at any given moment. Between us there are two mothers and four fathers. But we are all sisters. As we got older, each of our own homes became temporary places to stay for the others. A place to crash and talk out the chaos of our lives whether it be for a day, a week or a few months. We would gather for birthdays and graduations, but there was always certainly one of us missing. Scheduling a gathering of all of us was difficult; but when we came together in any capacity, there were usual sibling jokes, clothes-swaps and unsolicited advice. Now, in the midst of our young adult lives, we each seem to have drama with one another every few months. It is hard to keep up with who is speaking to whom. Our family dynamic, like always remains messy and complicated. But when one of our own leaves us, we struggle together. This past week, we each received a call with someone telling us that our sister had died. Losing our big sister will be another string that binds us as family for the rest of our lives. Faith and her sisters: "Between us there are two mothers and four fathers. But we are all sisters." We crazy kids came from different sets of parents. Between us there are two mothers and four fathers. But we are all sisters. We have all lost a small piece of joy in our hearts. I hope that in the years following we can learn to fill the empty spaces with more compassion and love for one another. Last night, my late sister's four year-old son held my face in both his hands and said,"You look like my mom." Now technically, this could not be biologically possible, but maybe he was seeing something more. Maybe he saw his mother when I make my silly faces or dance around the room or laugh like a hyena. I know that Greyson could be around any of his aunts and see the exact same thing. I look into his beautiful blue eyes and see my sister and that will forever be both haunting and a gift. This little boy has copious amounts of love from each and every one of his mom's sisters. And maybe one day, we will have to write out a another complicated diagram to explain to him how we are connected. But maybe the picture will just be a circle this time. We love and lose together. We are strong little women. And we are sisters.